I am a contemporary abstract painter, working in acrylic and mixed media. A native of Illinois, with degrees in chemistry and political science, I pursued a career in policy analysis in the Washington DC area for more than 30 years. Then I took up painting, fell in love with it, and retired early to follow my new passion. For me, painting is part of life’s journey of exploration and expression. 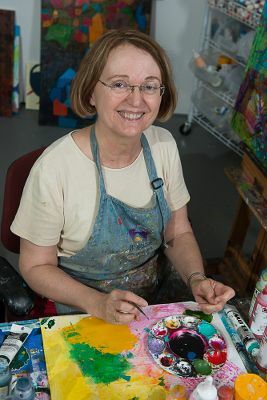 I began my journey as a painter based on a desire to explore color in all its bright and joyful aspects. My paintings are full of bright, saturated color, energy and movement. Currently I am pursuing the goal of making my colors luminous—to make them glow or shine. I am painting a series of abstract florals on long thin canvases—a perfect opportunity to explore the luminosity of color. My previous series explored the new fluid and high-flow acrylic paints by pouring, dripping, and manipulating the new paints. Prior to that I worked with thin layers of opaque, translucent, and transparent paint. This glazing process allows the light and colors in the deeper layers of the painting to glow through the upper levels, giving a beautiful sense of depth and luminosity, suggestive of stained glass. My inspiration comes from external sources such as the beauty of nature and internal sources such as dreams and imagination. Artists such as Matisse, Klimt, and a newly discovered source, Bill Scott of Philadelphia, also influence me. My goal is continually to search for a unique and authentic personal expression and to share that with others. Born and raised in Illinois, I received a BA in Chemistry in 1970 at MacMurray College. I moved to the Washington, DC area, to pursue graduate study at George Washington University, where I earned an MA in Science, Technology, and Public Policy in 1973 and a PhD in political science in 1983. I pursued a career in policy analysis for more than 30 years, then took up painting, fell in love with it, and retired early to follow my new passion. I have had solo shows at various locations in Northern Virginia and have exhibited in juried shows in Virginia, Maryland, Washington, DC, and Ohio. My paintings have won awards and are found in private collections across the country. I live and work in Great Falls, Virginia, where I founded AHH! (Art Happens Here!) Studios, which I share with several other artists. I have studied figurative painting and drawing, as well as abstract painting and portrait painting with leading artists in Northern Virginia. I also have taken course work in Religion and Art at Wesley Theological Seminary in Washington, DC. 2012—“Losing Her Edge,” élan magazine, April 2012, pp. 40-44. Studied with notable local artists, including Brenda Belfield, Jennifer Schoechle, Kurt Schwarz, Erik Swanson, Marsha Staiger, John Blee, Melanie Stanley, and Marise Riddell. Course work in Religion and Art at Wesley Theological Seminary in Washington, DC. Ph.D. Political Science, George Washington UniversityStudied with notable local artists, including Brenda Belfield, Jennifer Schoechle, Kurt Schwarz, Erik Swanson, Marsha Staiger, John Blee, Melanie Stanley, and Marise Riddell. Course work in Religion and Art at Wesley Theological Seminary in Washington, DC.